Browns owner Randy Lerner, and his father Al has spent quite a bit of money on general managers, and head coaches since the Browns came back into the NFL in 1999 without too much success to show for it!? It's been hard on the Lerners, and Browns fans across the country even the world! The Browns have had two winning seasons since coming back making the playoffs once in which they lost. The Browns have had big names and well respected coaches, and GM's that have come up short in their stint with the Browns? These people were associated with winning Super Bowls: Carmen Policy, Dwight Clark, Chris Palmer, Butch Davis, Romeo Crennel, Phil Savage, and now Eric Mangini, and Mike Holmgren. Head coach Eric Mangini started off last year very slowly with the Browns only winning one game out of the first twelve but finished strong winning the last four games. Coach Mangini did this by establishing a strong running game, special teams, and defense. Coach Mangini traded away TE Kellen Winslow, and WR Braylon Edwards for future draft picks leaving the offense with rookies playing in many spots on the offense. Going one and eleven cost GM Phil Savage his job, and it almost cost Eric Mangini his job! 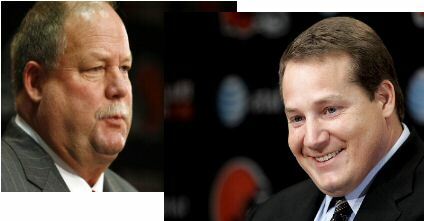 With Browns fans in revolt Randy Lerner seen enough, and fired Savage, and made a surprise move in hiring well known, and respected Mike Holmgren to take his place. The Browns winning the last four games in the row helped new GM Holmgren to make a decision to keep coach Mangini for this season. Thoughts on the moves made so far! Kellen Winslow loads of talent, injury prone, and a big ego that caused trouble in the locker room. I would say it was a good move. WR. Braylon Edwards, fast, big, and inconsistent also with a big ego that caused trouble on the team. Good move! QB. Derrick Anderson, big, strong arm, and showed signs of being great but was too inconsistent, and had big money coming his way in his contract. Good move! QB Brady Quinn, big, strong, decent arm, never given a fair shot, and great value with his contract. Kamerion Wimbley, big, strong, fast, one of the best passes rushers the Browns had! What Holmgren/Mangini got for these number one picks either in the draft or players they signed wasn't very good, in my opinion. They got the 86th pick in the third round pick from Oakland for Wimbley, and a 7th round RB Hillis plus two low round picks from Denver for Quinn? Holmgren signed 36 year old Jake Delhomme who was benched last season by the Carolina Panthers? Get this Delhomme signed for million a year to do this!?? All I can do is hope that this works out, and I know the Browns will be drafting our future quarterback this upcoming draft. My old guest book got erased ! So if you feel like signing it again it's much appreciated!